MIGRATIONS presents a number of my chamber works written for contemporary dance performances, ranging from the nervous energy of minimalism to the rich chromaticism of expressionism. Each piece is structured with clarity and intimacy, drawing the listener in, taking us on an exhilarating journey or offering moments of contemplation. Sidi Larbi Cherkaoui's mesmerising "Noetic" with my score for orchestra, voice and percussion is back in Goteborg! Performances: 7, 12 and 16 November. For more details please check the calendar! Polish pianist Barbara Drazkowska continues her Green Pianist tour on Green Velo Route in Poland where she will perform my music from our soon-to-come album "Murmur". During the opening ceremony of the 10th International Animated Film Festival ANIMATOR a cross-section of Polish animated films will be screened along with "Figury niemożliwe i inne historie II" (Impossible Objects and Other Stories II) by Marta Pajek. This superb film will be accompanied by my score for string orchestra, piano and percussion, performed live by Orkiestra Antraktowa and pianist Barbara Drążkowska. Between 8-11 of June, La Monnaie in Brussels will present Noetic, a dance performance created by Sidi Larbi Cherkaoui with the Göteborgsoperans Danskompani. I am very excited to present my new piece "Rumi Partita" for harpsichord and strings at the "En Avant Mars Festival" (concert "Generations"). The festival takes place in Muziekcentrum De Bijloke in Gent (Belgium) on the 16th of March. From 12th - 15th of January internationally acclaimed "Sutra" with Szymon's score will be presented during the Santiago a Mil Festival in Santiago de Chile, where it starts its 9th year of touring the world. "For Overture, Dawson gathered the same artistic team he had worked with on former productions. The music is by Polish composer Szymon Brzóska. Its first tunes call Dawson’s “Tristan + Isolde” to mind, but soon the music changes its shading. Rhythms push energetically forward interrupted by phases of melancholically tinged longing. Brzóska’s music oscillates between being grounded and rising towards a spiritual realm. Sometimes his violins seem to sound from another sphere." 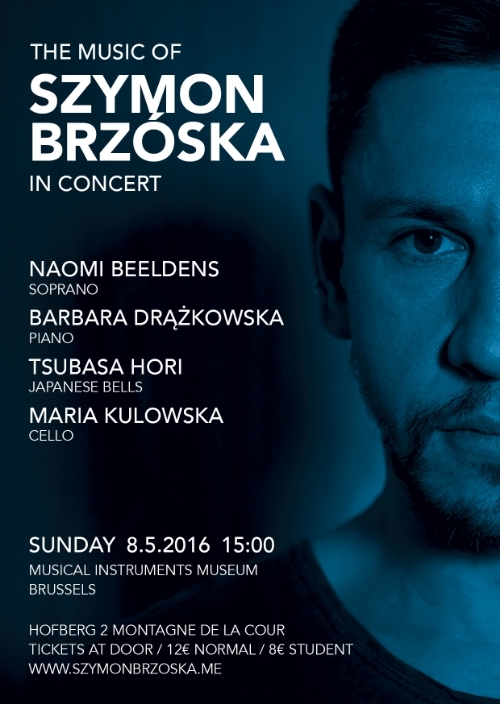 For the first time played in Brussels, this concert will present some of the composer's works for cello and piano, and songs for soprano and piano, with poems by Rumi and Karthika Nair. Two performances with my music: Noetic and Tristan + Isolde are being performed in December and January in Gothenburg (Sweden) and Dresden (Germany). Please check the calendar for more details!